W3C is pleased to receive the Semantically-Interlinked Online Communities (SIOC) Submission from DERI, Fundación CTIC, Asemantics, OpenLink Software, Opera Software, STFC Rutherford Appleton Laboratory, DFKI. To achieve these goals SIOC defines a series of OWL ontologies. 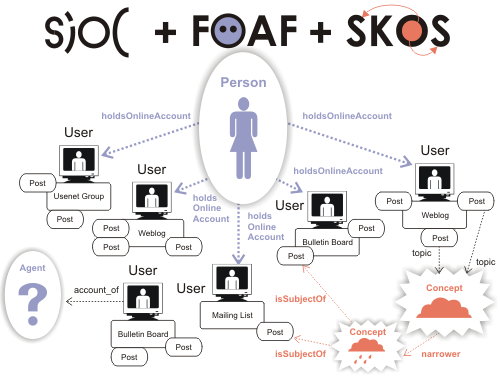 By providing these common vocabularies it becomes possible to exchange data among different online communities, link conversations for the purpose of a common project, extend personal information (like, for example, FOAF data) with roles the person may play in a specific community (e.g., contributor, administrator, etc). The vocabularies define terms such as topics of items (blogs, news items), authors, previous and next items (e.g., to describe threads of conversations), etc. This subject area (blogs, wikis, etc) makes SIOC potentially very important to Semantic Web applications in the context of various “social”, Web 2.0 sites. One of the submitted documents (“Related Ontologies and RDF Vocabularies”) gives some more details on how SIOC relates to FOAF, Dublin Core, RSS1.0 and SKOS. However, the OWL specification of the “types” namespace reveals even more connections than the ones described in the submitted document (it is a pity that those connections have not been made more explicit in the accompanying text). A possible criticism on the submission is the lack of some sort of a primer or more detailed guide (the scholarly publications, referred to from the documents in section 3.2, do not replace those). SIOC is not a small vocabulary, and the examples given in the submission are deceptively simple compared to the complexity of what can be described. It would be good to see such guides more widely available in future. The namespaces defined by the submission are owned by the submittor, which is encouraged in Semantic Web architecture. However, the submission does not currently describe the policy with respect to changes; in our view it should do so; see the TAG finding on Disposition of Names in an XML Namespace. As soon as there is metadata about a person—even being linked to some “thing”—this is considered to be personal data and falls into the regime of privacy protection. A section or paragraph about those issues is clearly missing from this submission. The privacy challenge was partly addressed by W3C in the Platform for Privace Preferences (P3P) specification. Most sioc:Site-s that collect and distribute SIOC related data may be interested in using P3P to describe their privacy practice. Though there is a certain overlap of some of the terms used by the two specifications (eg, sioc:name and P3P’s user.name), and an RDF Schema for P3P is also available, the fact is that P3P applications themselves are not using this RDF schema and we are not aware of any deployed RDF privacy tools that use the P3P RDF schema. However, there are lots of research going on in the area of privacy, constraints (e.g., access control), and rights management related to community sites. The ontologies of the PRIME project may be of some help to address privacy issues, and the methods of the policy aware web project might also be inspiring for developers and users of this SIOC specification. There is clearly more research needed in this area; it is important to keep the general privacy concerns in mind for future work on SIOC. A final comment is related to a design pattern adopted by SIOC, namely the fact that a number of property pairs are explicitly defined that are the inverse of one another (e.g., sioc:subscriber_of and sioc:has_subscriber). Although these properties are properly defined as inverses via the owl:inverseOf property (thereby avoiding any ambiguities) it should be pointed out that this practice leads to a possibly unnecessary duplication of terms. The blog entry of Tim Berners-Lee and the resulting set of comments might be of interest in this respect. There are already a number of tools, browser extensions, special browsers, etc, that are built around the SIOC concepts. A separate document, part of the W3C submission, is a report on SIOC applications and implementations, which include plug-ins to popular blogging software like Wordpress or b2evolution, or an extension to Firefox to explore SIOC data. The SIOC vocabulary is a useful component of the Semantic Web. SIOC is based on RDF and OWL and does not appear to demand new features of those base technologies. It would be interesting to see whether the evolution of OWL (currently referred to as OWL1.1 and is a proposed new work item within W3C) may provide additional features that could be exploited in future releases of SIOC. There is an explicit relationship between SIOC and W3C work on SKOS. Indeed, SIOC uses references to SKOS categories (e.g., as a possible object of the sioc:topic predicate). Though SKOS is still under development in the Semantic Web Deployment Working Group, this aspect of SKOS appears to be quite stable, i.e., the future evolution of SKOS is not likely to invalidate the current usage of SKOS by SIOC. On the other hand, deployed SIOC applications may provide good use cases for SKOS in the future. The Semantic Web architecture allows and encourages communities to develop and deploy vocabularies and ontologies with no obligation to register them with any central authority. W3C itself normally refrains from standardizing vocabularies or ontologies for specific application areas unless they have foundational character (e.g., SKOS) or they are an integral part of some other W3C activity (e.g., CC/PP). It is indeed very much in line with the ethos of the Semantic Web for vocabularies to be defined by various communities, user groups, domain experts, and made publicly available. SIOC is a fine example for such a vocabulary. Finally, SIOC usage should be another valuable use case for the Policy Languages Interest Group, if chartered by the W3C Advisory Committee (see the PLING charter draft, currently under review by the AC).